The drive itself is small, just 41x152x219 mm in size. However, one main use of this drive is portability, and the hard drive is small, but it could be smaller to make it easier to carry. It weighs about 2 pounds and 11 ounces, which is manageable. The drive has a nice bluish shiny coat, and black rubber corners. The front of the drive has two LED lights (one is orange, the other is green), and the OneTouch button. 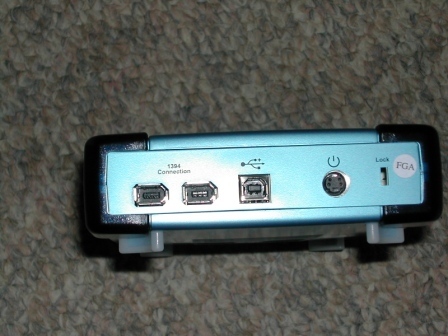 The back has a power port, a USB 2.0 port, and two FireWire ports. 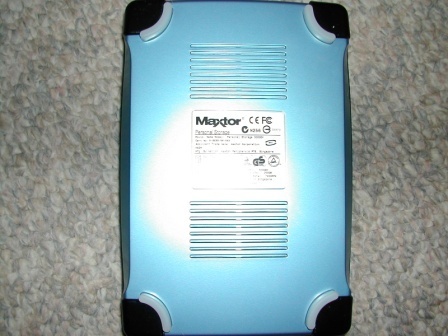 The bottom has a sticker with information on the drive, including the serial #. 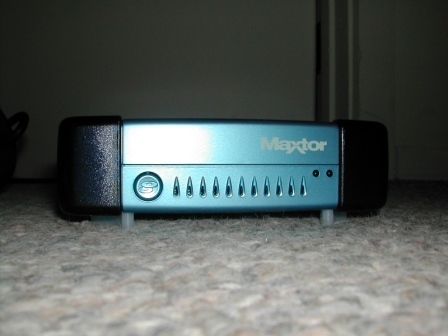 Unfortunately, Maxtor didn't put a power switch on the drive. This isn't a big complaint, but it would have been nice.